Gujarat Divya Jivan Sangh organized three day spiritual retreat at the bank of Narmada at holy Sri Satya Narayan Temple complex, Malsar near Vadodara. Rev. 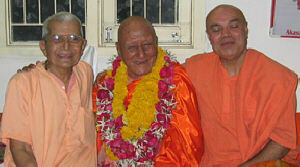 Sri Swami Adhyatmanandaji Maharaj with company of H.H. Swami Shankaranandaji, Sri Swami Gurukrupanandaji, and Sri Swami Paramanandaji Maharaj graced the retreat. It was attended by one hundred spiritual seekers. Prayer, meditation, yogabhyas, pranayam, Gita recitation were followed with Pujya Swamiji’s discourses and question & answers session daily during the retreat. Holy bath in Narmada River and boat kirtan were amongst memorable events for the participant of this spiritual retreat. H.H. Sri Lalji Maharaj, a learned saint of Malsar, invited Rev. Swamiji Maharaj to inaugurate “Sri Sunder Kand Parayan Yajna” and to felicitate two Kathakars, who had done one hundred and eight (108) Srimad Bhagwat Katha and Sri Ram Charitmanas Katha. At the Ashram, large numbers of devotees participated in Maruti Yajna and recitation of Sunder Kand from Sri Ramcharit Manas on Hanuman Jayanti day. 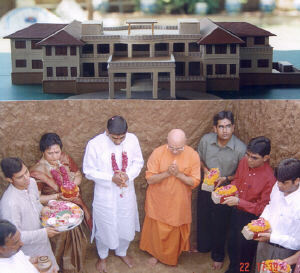 Renovation of Sri Hanuman Temple at the ashram premises was commenced ceremonially by Sri Swami Maharaj. A special satsang was arranged at the ashram to celebrate 89th birthday of H. H. Sri Swami Shankaranandaji Maharaj (Dada Swamiji), a senior monk of Sivananda Ashram, Ahmedabad. A large gathering of devotees greeted Sri Swamiji Maharaj and received his divine blessings. Program of devotional music was arranged and it was followed by dinner. Pujya Swamiji made a hectic tour to Himmatnagar, Bhajpura and Choriwad in Sabarkantha district of North Gujarat for Saint Sammelan ( Saint Meetings). Pujya Swamiji presided over and spoke on the subject of Advaita Vedanta (Non-Dualism) Philosophy. He stressed the need of regular Sadhana to cultivate higher values for Spiritual growth. Swamiji emphasized that the real nature of the Atman is beyond description, though for the purpose of our guidance, sages have described as Satchidanand Swaroop (Existence absolute, knowledge absolute, Bliss absolute), Shantam- Shivam-Advaitam ( peace, auspicious, one without second, the transcendental one that remains when all names and forms have been negated)- these are some guiding hints.Your inner most Self which is awake while you are asleep, which is beyond mind, body and senses – that is Atman. This meeting was attended by about ten thousands devotees of the Lord. Mid-day meal was served to devotees who came from far. A congregation was organized by Vishwa Hindu Parisad in which leading saints of Gujarat participated. What should be the attitude of the religious heads and intellectuals as pertains to Parliamentary Election? This was the theme of the topics discussed and dissected on the eve of the election. Rev. Swamiji Maharaj gave invigorating discourse that captivated the crowd. Kumbha Mela - Simhastha -2004 at Ujjain . On April 15, 2004 Pujya Swamiji went to Ujjain Kumbh Mela – Simhastha, 2004. Sri Swamiji Maharaji’s discourses were arranged at Sri Bharatmata Mandapam of Mahamandaleshwar Srimat Swami Satyamitranandaji Maharaj. Rev. Swamiji’s discourses were recorded and telecasted by Sanskar and Astha T.V. Channels. Eight days long residential camp for children commenced on April 22, 2004 with lightening of the lamp by Rev. 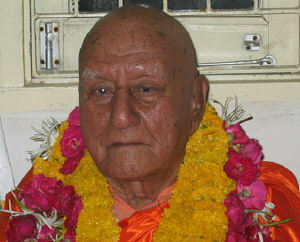 Sri Swami Shankaranandaji Maharaj (Dada Swamiji). Looking to the availability of the space, only one hundred children were admitted to the camp. A systemic schedule had planned out for the Children to follow during the camp. The goal of the camp is to encourage the children to live disciplined life of virtues. Spiritual teachings were imparted through fun and games by qualified and experienced teachers. Activities like yogasana, meditation, japa, chanting, karate, music, painting, drama, folk dance are also incorporated in these eight days curriculum. Children had a talent show at the end of the camp. It was indeed an enjoyable and unique experience for all the children who attended the camp. Satsang at Himavan Paldi Center. Pujya Swamiji with few devotees visited and had satsang at Himavan Paldi center of Divya Jivan Sangh. He felicitated Sri Narendrabhai Varatiyaji for his kind Service for many years at this center, on this occasion. Sri Varatyaji's is retiring because of his delicate health and Sri Arvindbhai Mehta is taking charge of all activities at the center. · On April 4, Sri Swamiji went to Mumbai for a special event. He presided over a mono play ‘Vivekananda’, by a versatile singer, composer, writer and an actor - Sri Shekhar Sen. Swami Adhyatmanandaji released audio cassette and CD of his play. In the past Sri Swamiji Maharaj released his two memorable albums of Sri Tulsidas and Sri Kabir. During his short visit to Mumbai, Rev Swamiji visited houses of devotees and inaugurated dental clinic of Dr. Chandrahas and Dr. Tarak Vachharajani. · On April15, 2004 Rev. Swamiji was invited by Femina Club, at very famous Orient Club premises in Ahmedabad. He addressed to the members of the club on the subject of “Stress Management in day to day life”. · Pujya Swamiji inaugurated health promoting exhibition‘KAYAKALPA-2004’, which was attended by Ms. Dipti Naval, an art film actress of Indian Films. · On April 20, 2004 , at the ashram, holy Maha Rudra Yajna was concluded in presence of Rev. Swamiji Maharaj. Rev. Swamiji Maharaj spoke on the higher meaning and purpose of yajnas, rituals and its benefits. · On April 22, 2004 Sri Swami Adhyatmanandaji Maharaj was invited and laid the foundation stone for the corporate house of RAMDEV food product company. Also Sri Swamiji inaugurated the “Pacific Juice and Snacks” home with 3000 juice varieties parlor late in the evening. · Sri Swamiji Maharaj attended the farewell satsang of H.H Sri Pramukh Swamiji Maharaj of BAPS Swami Narayan Samsthan. Pujya Swamiji prayed for Sri Pramukh Swamiji Maharaj’s good health and blissful journey to Europe, UK and USA for six months. 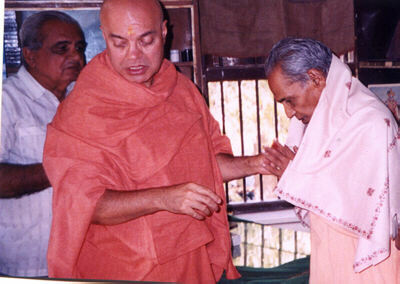 Sri Pramukh Swamiji Maharaj blessed the Swamiji. It is a sight for the devotees to witness, the two Mahatmas having mutual love, reverence and honor for each other. · On April 30, 2004 Sri Swamiji Maharaj’s discourses is being organized by 11 Core’s Army Officers and their Jawans and respective family members. · This month's home satsang was held at Smt. Raginiben’s home. All the saints with the devotees of ashram joined the satsang at her home..
· Weekly Mrutyunjaya mantra chanting, monthly grain distribution to the needy and poor, feeding to Daridranarayana on 3rd of each month is being done by devotees of ashram regularly. · Daily yoga classes are the biggest attraction of the town and yoga lovers. · Ashram management has widened the existing lawn and planted new trees in “Sivnanda Udyan” recently. In the presence of Sri Swami Adhyatmanandaji Maharaj. For further details and registration, please contact Sivananda Ashram, Ahmedabad.